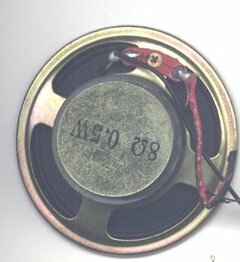 If you happen to install a modern GNU / Linux distribution to a relatively old computer hardware with an ISA non-PNP (Plug and Play) soundcard it will be not visible neither among PCI devices list with (lspci) command nor in USBs list (lsusb). 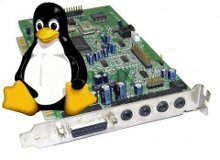 Thus with ISA cards, the way to configure a 16 bit SoundBlaster is via a special kernel modules snd-es18xx and snd-sb16 which thanksfully is still existent even on latest Linux distros. Without this two modules enabled in the kernel trying alsamixer command will be unable to launch the mixer as the soundcard is not detected on run of /etc/init.d/alsa start – ALSA enabling boot script – loaded during the system enters runlevel 2. 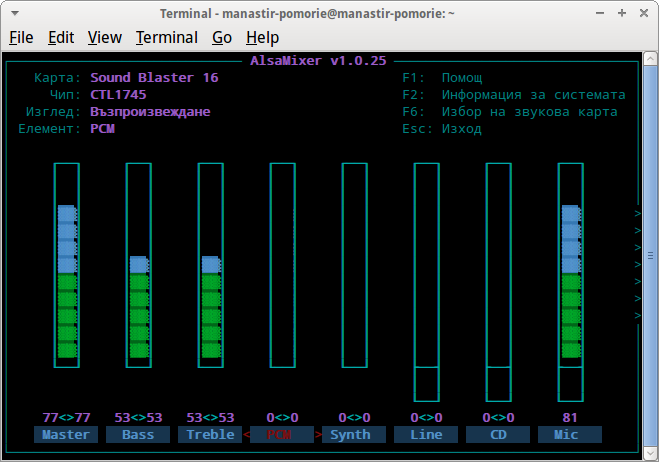 After raising the volume level for PCM and testing in browser thanksfully soundblaster worked fine. Below config was little modified by me as by default it was configured to run in 1280×1024 in 24 bit depth color. Usually 24 bit color is high for old cards, plus the resolution of 1280 seemed quite high for this piece of old iron, so I decided to use the better suiting old computers 1024×768 in 16 bit color depth. I'm just coming from being a guest to dear friends. They're having a bit old hardware PC running Windows XP and some old ATI Radeon model video card. A video was played in youtube so I noticed the video is displaying very slow. The PC hardware was good enough to play videos with no delays and image chops, so I give it a check. I've earlier, seen old Computer hardware creating similar video delays and chop issues with Played videos thus to see if this will solve the issue lowered down video resolution 1024×768 with 16 bit color depth. Video continued to be showing slowly in every few seconds and display "choppy", so I excluded it as cause. Very surprisingly the Flash Player was not installed! 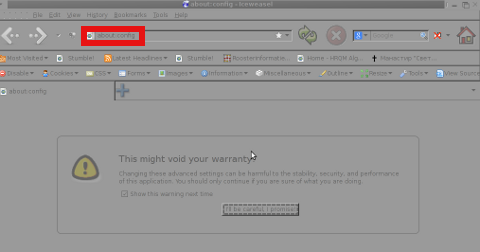 I hurried and install – googling, "install flash player" and following the trivial install procedure. Then I give Firefox a restart and tested video with Alexander Nevsky Russian Movie (which btw is an interesting one to see for people who value art and history). The movie chops continued, I checked Flash version clicking on the video again just to determine, weirdly still Youtube was displaying videos usiong HTML5 (WebM) format! I check once again if flash player is properly installed in about:plugins and weirdly all seemed fine I had on the PC properly working installed Adobe Flash 11.x.x. Now this was weird ? 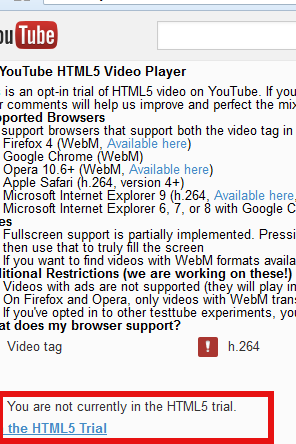 For a first time I had a situation, where even though I installed Flash Player, Youtube continued to show videos using HTML5 WebM (open source video format). Now I should say I'm a big fan of HTML5 and open technologies, so HTML5 is great, the only problem is it still not production ready so for ordinary user Flash Player is still better – Flash's video buffering is much better, its compression is better, it is less buggy etc. etc. It took me a bit of pondering Why Youtube was showing videos in HTML5 instead of using the Installed and working Flash Player?? After about 5 minutes of googling, I came to conclusion the person who fixed their Software, some months before had on purpose choose Youtube to be displayed with Experimetnal HTML5. 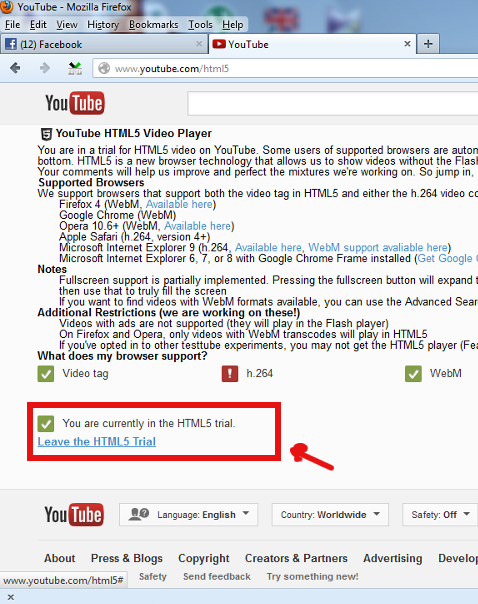 I was not sure how to check if HTML5 is set as a default player in Youtube, so looked on the net, The page to change it is found by googling for "youtube html trial". The movie is an interesting watching for people interested into Information Technology and gives some minor insights on the starred interviewed people and their life philosophy. It was interesting times back then and it seems many of the guys who could participate in the PCs were very lucky, where others who made key developments which are de-facto standards today went into history without much being remembered. Now the trends which these man set in world’s development is not nice. Even though PC brough a lot of fun in our every lives it suddenly started taking over our privacy and made the humanity divided. The movie is a story of a man motivated by greed arrogancy and exploitation. Even though the movie has historical value it doesn’t even mention about Free Software Richard Stallman and the free software movement. 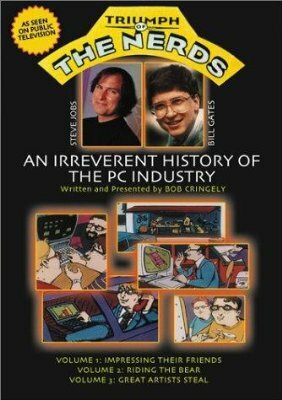 The movie talks about the development of CP/M the predecessor of Quick and Dirty DOS (QDOS), MS-DOS Windows 1,2,3, Windows 95 etc. It also tries to picture the events around the raise and fall of IBM and OS/2. The most notable parts for me in the movie are the showing off of some old computer hardware and Mainframe servers as well as the quick explanation on how Mainframes irons predecessed the PC. Another interesting moment in the movie is displaying Steve Jobs demonstrating the Xerox’s Alto graphical interface. Talking about Jobs it was quite shocking for the world his sudden death just 3 days ago so (R.I.P). Triumph of the Nerds slightly mentions Digital Equipment Corporation / DEC or COMPAQ as later known. DEC is company less known in todays world which had historically great impact on computer market, so its a pity the movie part mentioning DEC is so short. What the movie misses is to aforemention About’s Digital Equipment VMS operating system known under the code name OpenVMS. 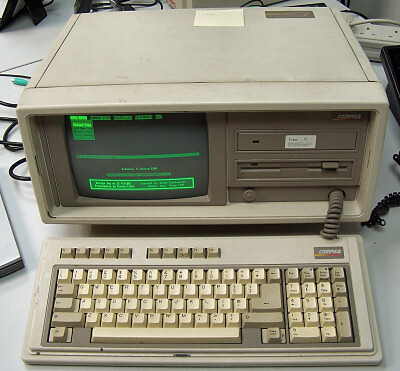 OpenVMS even of today is believed by many to be the most secure Operating System ever developed. The movie part that talks about DEC is the second part of movie it shows a nice COMPAQ portable computer. One serious flaw with this movie is the complete lack of interviews with Richard Stallman and the importance of Free Software for the development of modern PC and the influence of the free software culture on todays latest Macintosh and PC developments. Triumph of the Nerds brings back some good memories of the glorious PC computer past for all of us who had been a DR-DOS/MS-DOS and Windows 3.11 / 95 users.